My infatuation with Vietnamese pottery began with an unassuming plate that I saw at the National Museum in Tokyo. It was a white-slipped plate with a flower painted in the center coated with a milky glaze. The loosely drawn flower was joyful and full of life, and I was completely captivated by its charm. When I discovered that the plate was made in Vietnam sometime during the Ly and Tran Dynasty of the 13th and 14th centuries, I began to dream about visiting that haunting country someday. 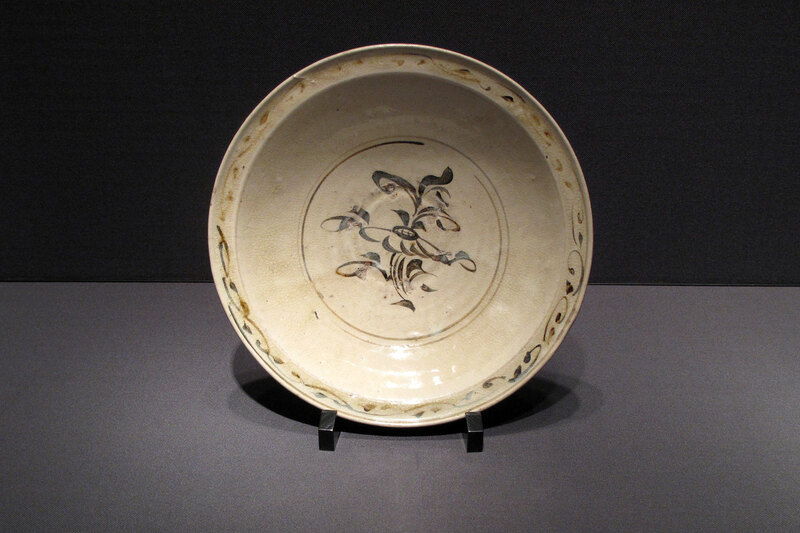 Dish in Tokyo’s National Museum with flowering plant design in underglaze iron, from 13th-14th Century Vietnam. The opportunity to turn this dream into reality came suddenly this past mid-January when a Vietnamese-American friend invited me to visit Vietnam together. I quickly agreed. But I soon discovered that there was very little information on where to go and see ceramics in Vietnam. 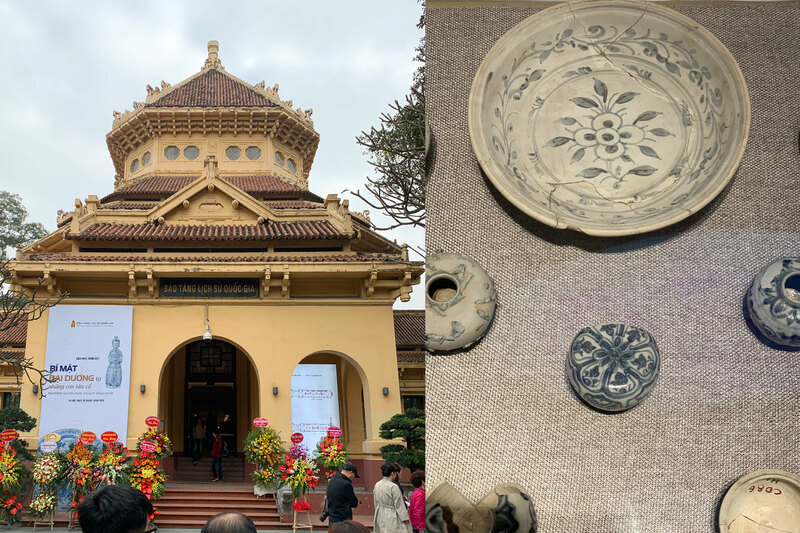 Two vague tips that I received was the Bat Trang (Bát Tràng) pottery village located southeast of Hanoi on the banks of the Red River, and the National Museum of Vietnamese History in Hanoi (Hà Nội), which was said to have a good collection of historic Vietnamese wares. With these clues, I hopped onto a plane for the 20 hour plus journey to Hanoi. Bat Trang pottery village is about 45 minutes on Bus No. 47A from Hanoi’s Long Bien Bus Terminal. A taxi will get you there a lot faster, but I enjoyed the slow ride to absorb the lush scenery and Hanoi’s energy that is topped with traffic chaos. The bus took us to the center of the village. Bat Trang was exactly what I thought it would be. 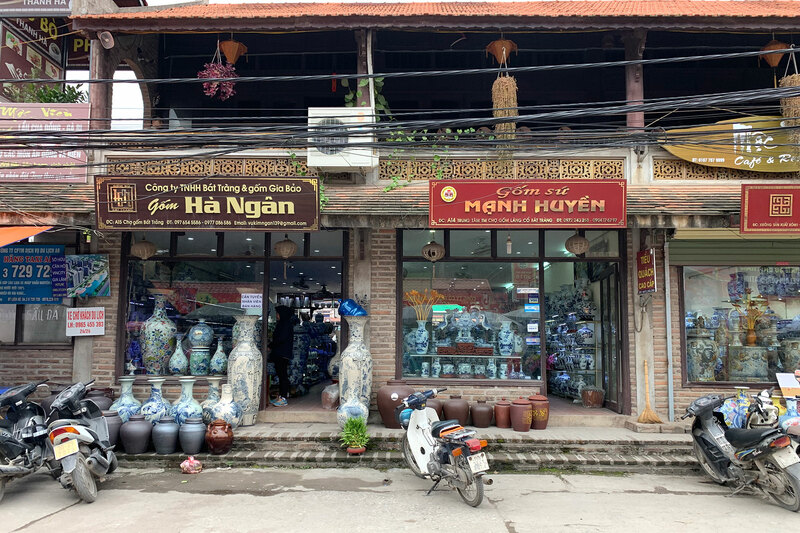 A village with ornamental large jars and lots of affordable tableware for everyday use, all in the contemporary styles that are preferred by Vietnamese people today. Most of the pots seem to have been made by slip casting. Left: Bright colored bowls and cups. Right: A lady packing bright colored ceramic pigs probably for the Vietnamese lunar new year celebrations. 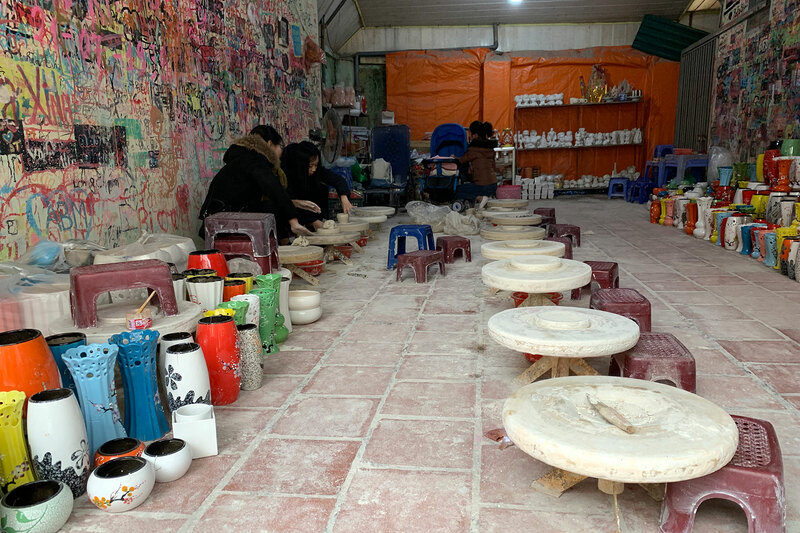 Very low hand wheels with matching tiny plastic seats at a shop where customers can experience making pots. 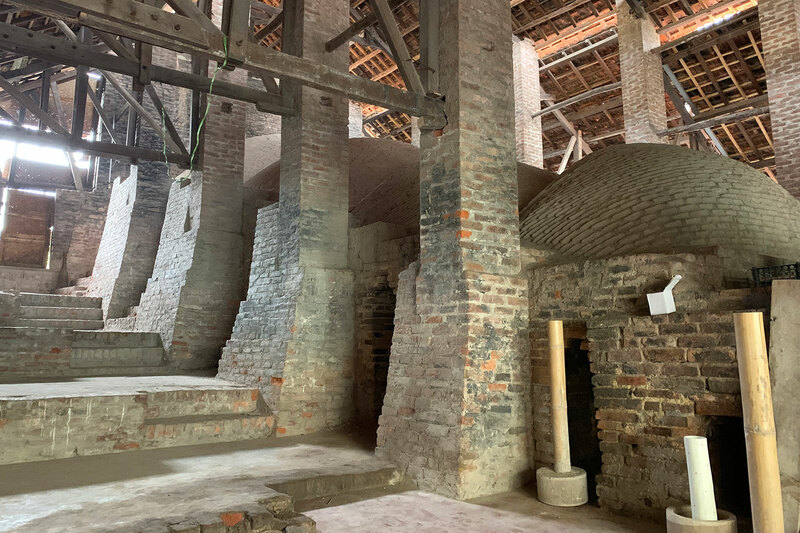 Multi-chambered climbing kiln in Bat Trang. The kiln did not appear to have been used recently. Although the bright colors and shiny glazes were not exactly to my taste, it was still fascinating to see that the Vietnamese use so many different types of vessels that reflects the country’s rich food culture, like small dishes for sauces, small lidded jars and cooking pots for fish soups. 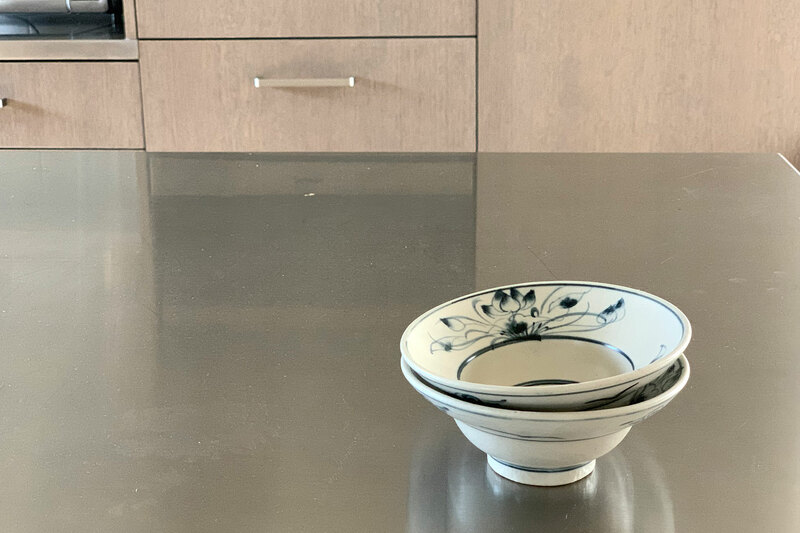 There were popular soup bowls in various sizes with large curved rims that I have rarely seen elsewhere, so I bought a few to take home. Little bowls with curved rims from Bat Trang, Vietnam. 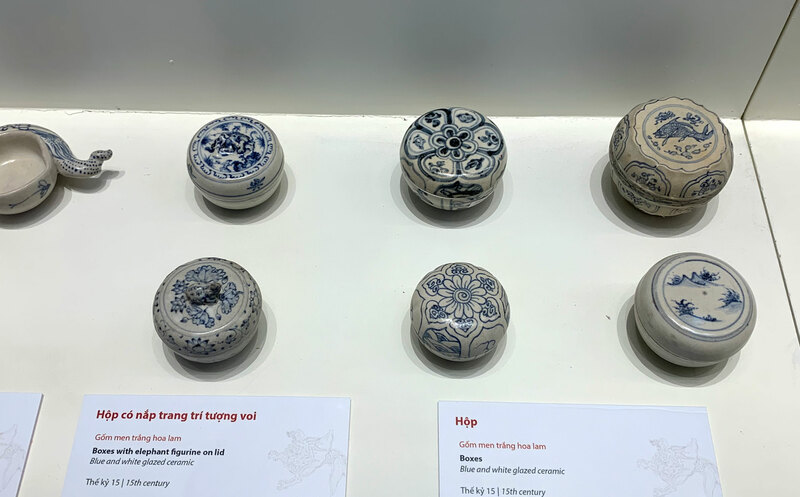 It was by pure chance, which I interpret as destiny, to arrive at the National Museum of Vietnamese History just as an extensive exhibit opened of 13th-18th century ceramics excavated from ancient shipwrecks off the Vietnamese coast. This show started on January 18th 2019 and runs until May 18th 2019. So if you are in the area, I urge you to visit it. 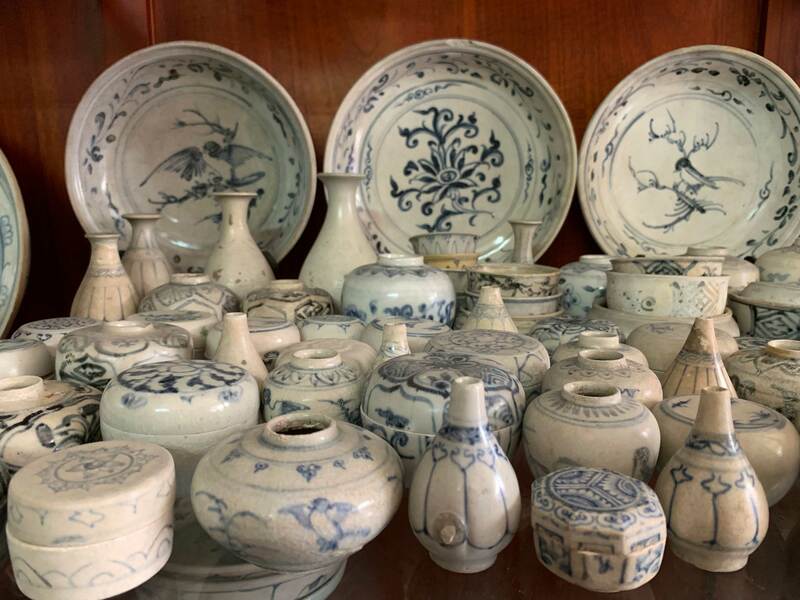 About 500 pieces of pottery were on display, many of which were my favorite Vietnamese blue-and-white ceramics from the 15th century. In the current Japanese handmade pottery scene, there are many makers who have been heavily influenced by this era of Vietnamese pottery. It was interesting to observe that the current ceramics taste in Vietnam is moving away from these traditional painted styles, while in Japan the “Annam-style”, is having its moment. As a modern day importer of handmade ceramics, I get cold sweat thinking about a big chunk of my orders sinking in the ocean on its way to the US. But my creative imagination exploded with these remnants from the shipwrecks because they offered a unique window into the aesthetics and lives of Vietnamese people from the distant past. 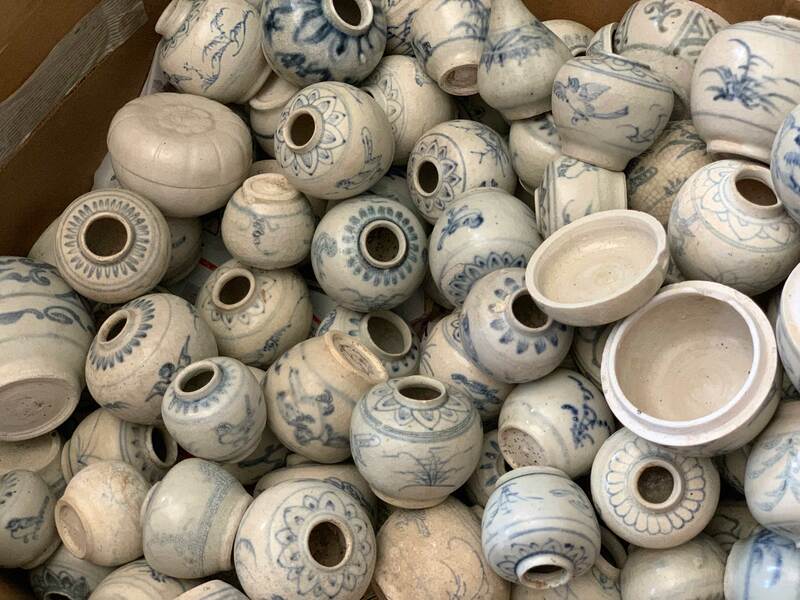 After witnessing the tastes and skills built into these pots, I could understand why they were coveted by people from so many surrounding countries, and such great efforts were made to trade them overseas. I had no pointers of where to go in Ho Chi Minh (Hồ Chí Minh) City for pottery, so I took the advice of Professor Matsui, one of Japan’s leading experts on Mingei who told me to “study objects from the past to understand Mingei and the beauty of handmade items for use.” Which meant that I hit the streets to look at antique stores. 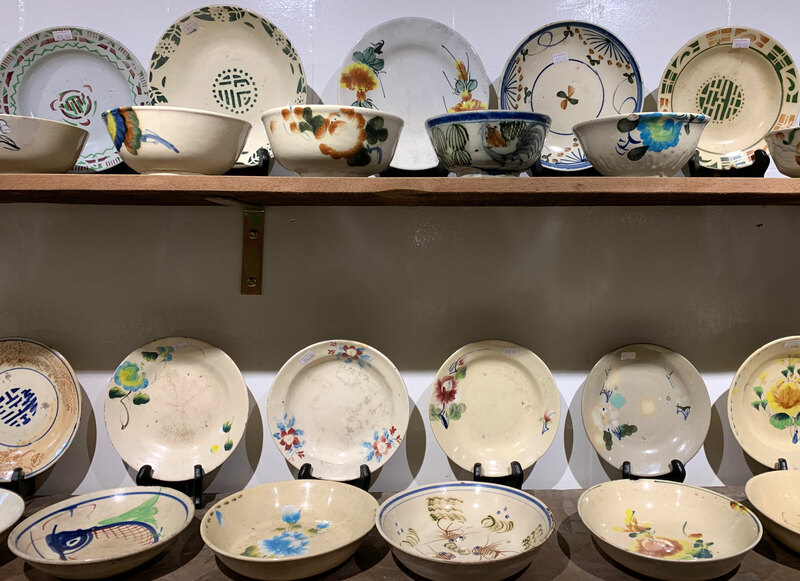 I had never heard of “Song Be (Sông Bé)” ware, but a friend who lives in Ho Chi Minh said it was local, everyday use pottery, that was influenced by the French, who had ruled Vietnam between the 19th and 20th Centuries. 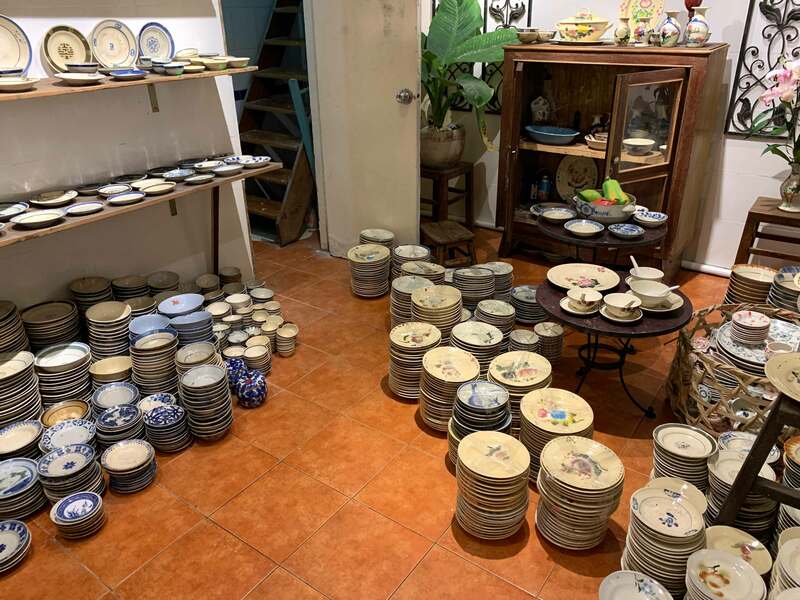 Indeed I see similarities to the French Strasbourg and Quimper ceramics, along with some Chinese influence, but overall it is distinctly Vietnamese in spontaneity. These pots made me think about the resilience of the Vietnamese people, and their long struggle of facing hordes of foreign invaders, which sadly included Japan during the Second World War. Some people said that Song Be kilns are still making pottery, while others told me they have stopped production. I hope to find out definitively what the current situation is soon. 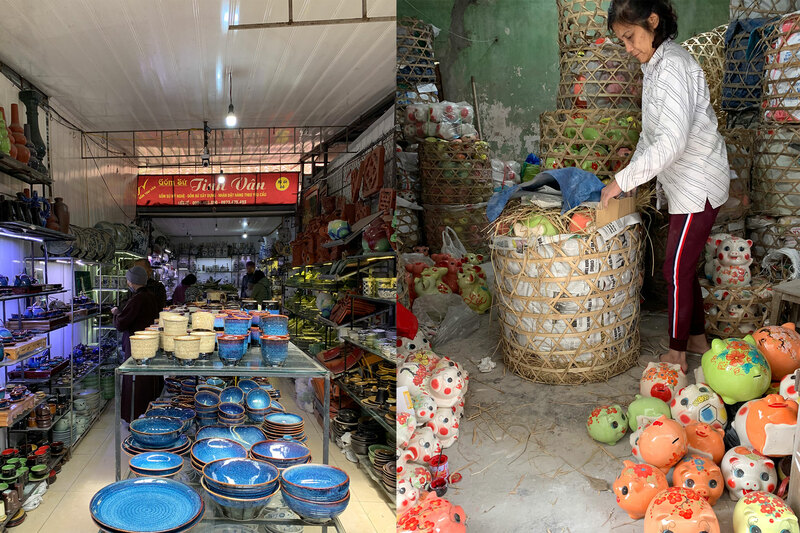 In one of the shops on Antique Street that I visited in Ho Chi Minh, I found a mound of blue-and-white small jars and covered jars that looked very similar to the ones I saw at the museum in Hanoi. A huge pile of jarlets at an antique shop in Ho Chi Minh. Many had little birds drawn on them. The shopkeeper told me that fishermen had found these items in the ocean. I was very surprised that precious 15th century pots were so casually sold! From the pile, I chose a covered container that had a beautiful painting of a flower, drawn in distinctively relaxed Vietnamese strokes together with a few jarlets. I later found similar pots online, with mention of them being “Hoi An hoard”. I’m not sure what this means, but want to find out more about them. More shipwreck pottery at an antique store in Ho Chi Minh. In this one week trip to Vietnam, I felt like I did not even scratch the surface of grasping the mystery of Vietnamese ceramics traditions that I am so attracted to. But the visit reinforced my conviction that there is much more to discover and learn in Vietnam. Initially, I was very surprised at how little is published on Vietnamese pottery, despite its long and rich traditions. But as Yanagi Muneyoshi, founder of the Mingei movement once said, “In understanding beauty, intuition is more of the essence than intellectual perception. The reversal of these two faculties stultifies vision. To “see” is to go direct to the core; to know the facts about an object of beauty is to go around the periphery. Intellectual discrimination is less essential to an understanding of beauty than the power of intuition that precedes it.” So I am determined to visit Vietnam again, to see first, and maybe know afterwards.